Why it’s daunting: Comprising 24 volumes published between 1930 and 1986, the Belgian-produced The Adventures Of Tintin is one of the world’s most popular and enduring comic-book series—the thrilling, globetrotting exploits of the intrepid boy reporter Tintin, his loyal dog Snowy, and his quirky band of comrades. So why is the series scarcely more than a cult phenomenon in the United States? Chalk it up to odd timing. During Tintin’s initial run, American audiences were accustomed to consuming comics in one of two ways: adult-friendly newspaper strips and kid-aimed newsstand pamphlets. To its credit, Tintin—created as a serial by Belgian cartoonist Georges Rémi, better known as Hergé—boasts higher production values and an intentionally broad appeal. In fact, it helped pioneer the graphic novel long before it was known as such. But Tintin’s run ended soon after Hergé’s death in 1983, just as American comics were set to enter a new era of accessibility and acceptability. Then again, Tintin has always existed outside the trends of the comics industry—and beneath the radar of a large part of today’s burgeoning geek culture. That may all change with The Adventures Of Tintin, Steven Spielberg’s long-awaited big-screen adaptation. Regardless of whether the film succeeds in the States, Hergé’s original books are sure to see a surge in attention from American audiences who had never heard of Tintin before—as well as those who may have experienced Tintin only briefly via previous adaptations. But where to start? On other parts of the planet, Tintin is an instantly recognizable icon, a part of the cultural backdrop for almost a century. New readers, though, might feel a bit daunted by the series’ progressively involved mythos, cast of characters, and callbacks to prior adventures—despite the fact that almost all of the 24 volumes are self-contained tales. Hergé’s storytelling is as clean, vivid, and economical as his virtuosic ligne claire drawing style, but some books are far better at sucking in newcomers and making them feel instantly at home. Sadly, there’s another factor that may dampen one’s ability and desire to get into Tintin: the charges of racism that have swirled around the series and its creator for decades. Certain volumes in the series—most infamously 1931’s Tintin In The Congo—portray nonwhite peoples in a less than flattering (if not patently offensive) light. Hergé himself was accused of collaborating with the Nazis during Germany’s occupation of Belgium, a charge he refuted. That debate is heated and ongoing in certain corners of Tintin fandom. But for the most part, Hergé’s deeply human sympathy, wit, and warmth—not to mention the lightly cynical yet far more enlightened tone of his later volumes—suggest that reading Tintin in historical context is wiser than judging it in hindsight. In any case, the series’ embarrassment of riches far outweighs its missteps. Why: If anything good came from Hergé’s struggle to keep Tintin in production during World War II, it was a temporary retreat from potentially controversial topics like politics—and a full immersion in sheer adventure. Together, The Secret Of The Unicorn and its sequel, Red Rackham’s Treasure, make for a swashbuckling masterpiece.They also happen to be the main source material for Spielberg’s film—but that alone doesn’t make Unicorn and Treasure the best gateway to Tintin (although it doesn’t hurt). What makes the two-part story so inviting is its utter clarity and simplicity. Drawn into mystery by a web of outlandish coincidences—Hergé’s forte—Tintin and his salty, dipsomaniac, foul-mouthed friend Captain Haddock embark on a quest for pirate treasure that moves at a lightning clip. Hergé’s deceptively sparse draftsmanship only adds to the rush. Some of the large panels depicting pirate ships and jungle locales are jaw-dropping in detail, and the juxtaposition of Hergé’s iconographic human figures with far more lush, realistic backgrounds—a hallmark of his style—is at its evocative best. Visual puns and slapstick gags abound, creating an ideal balance between levity and peril. And Captain Haddock’s colorful, ever-evolving lexicon of expletives—“Bagpipers!” “Gallows-fodder!” “Prattling porpoise!” “Billions of bilious blue blistering barnacles in a thundering typhoon!”—takes on an absurd lyricism all its own. Granted, Unicorn/Treasure doesn’t have quite the same depth, intricacy, and sophistication as many other Tintin books. But that’s what makes it a great introduction; each major character is established early on in Unicorn, and within a dozen pages, it’s already crystal clear who everyone is, how they relate to each other, and why they’re off on such a crazy mission. The faithful Snowy and the bumbling lookalike detectives Thompson and Thomson serve pivotal functions in the plot, at the same time providing lighthearted distractions. And the books even introduce two vital and beloved secondary characters—the harebrained Professor Cuthbert Calculus and the indomitable butler Nestor—who go on to play larger parts later in the series. Next steps: 1936’s The Blue Lotus is the first truly great Tintin adventure. It’s also everything Unicorn/Treasure isn’t: timely, topical, and underpinned with international politics. Coming immediately after the excellent but still formative Cigars Of The Pharaoh, Lotus uses the buildup to the Second Sino-Japanese War as a backdrop for Tintin’s harrowing-yet-hilarious escapades in Shanghai. It’s also worth nothing that, five years after Tintin In The Congo, Lotus features a scene in which Tintin—in no uncertain terms—admonishes a white American villain for his racial bigotry. Hergé’s artwork hadn’t reached its pinnacle in 1936; in particular, his rendition of Tintin is slightly more round-headed and rudimentary than he’d appear later in the series. But as a seamless showcase of Tintin’s many joys—action, intrigue, humor, suspense, and history—it’s superb. And, like Unicorn/Treasure, it introduces a winning character that will come into play later: Tintin’s dear friend Chang Chong-Chen, for whom Tintin risks everything in 1960’s brilliant, heartfelt Tintin In Tibet. When it comes to first appearances of characters in Tintin, none is more epic than Captain Haddock’s in The Crab With The Golden Claws. The 1941 story—which, along with Unicorn/Treasure, is parted out for use in Spielberg’s adaptation—is another nautical adventure. It’s a lot moodier and more atmospheric than Secret/Treasure, though, due in part to Haddock’s introduction as a drunk disgrace of a seaman. As humorously as Haddock is utilized later in the series, Hergé takes care never to throw him away as a cheap punchline; it’s clear the creator had a huge soft spot for the bearded, swearing sailor, to the point where many subsequent adventures feature Haddock as much as Tintin. But in Claws, he’s a tragicomic figure with a truly poignant redemption story. The book is also a great example of just how universal Tintin is, juggling adult gravitas and juvenile gee-whiz with ease. 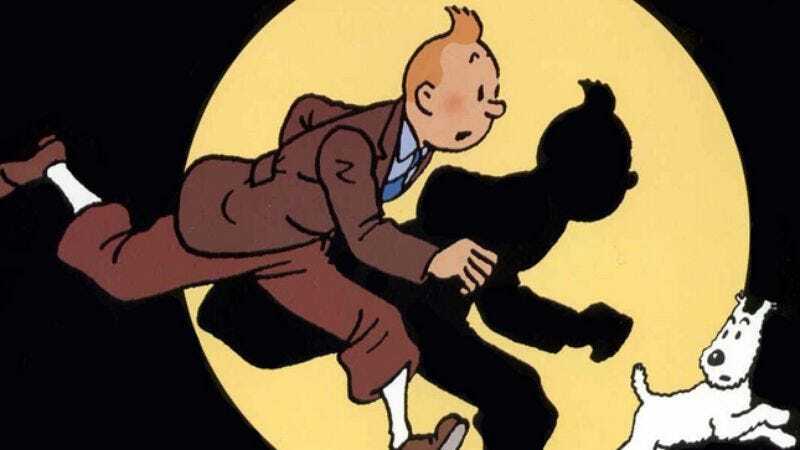 As previously mentioned, Tintin’s increasingly frequent callbacks to old characters and adventures are one of its most rewarding perks to devotees—and one of its few hindrances to newbies. And while it definitely helps to read The Blue Lotus before reading Tintin In Tibet, it’s not absolutely necessary; in Tibet, Hergé deftly and effortlessly reestablishes the unbreakable, nearly psychic bond of friendship shared by Tintin and his Chinese counterpart, Chang Chong-Chen. When Tintin deduces that Chang was on a plane presumed lost in the Himalayas, he mounts a reckless expedition to find him. Tintin’s unswerving, selfless determination to risk his life to find Chang—who may well be dead—epitomizes fraternal love, and it cuts through the copious laughs and thrills to reveal the heart that drives even the zaniest of Hergé’s stories. Tibet is arguably the greatest and most touching Tintin adventure; its lack of many secondary characters like the Thomsons, though, as well as its reliance on at least some foreknowledge of the series, are the only things that keep it from surpassing Unicorn/Treasure as the best Tintin gateway. Where not to start: For reasons already stated, 1931’s controversial Tintin In The Congo isn’t the best Tintin book to start with—not just because of the racist undertones (and sometimes overtones), but because the art and story are both strikingly crude compared to Hergé’s subsequent refinement. By the same token, the debut Tintin volume, 1930’s primitive Tintin In The Land Of The Soviets, is more of a book for completists and the curious. Helping form an unfortunate bookend to the series, the final Tintin installment—1986’s poorly drawn Tintin And Alph-Art, which was pieced together from sketches and notes, finished by others, and published after Hergé’s death—unsuccessfully tries to update Tintin and then cram him into a caper involving the contemporary-art world. As for Tintin And The Land Of The Sharks: non-canonical and cobbled together from animation stills, it’s a relatively lifeless adaptation of the lackluster 1972 film of the same name. Here’s hoping Spielberg doesn’t get any ideas.